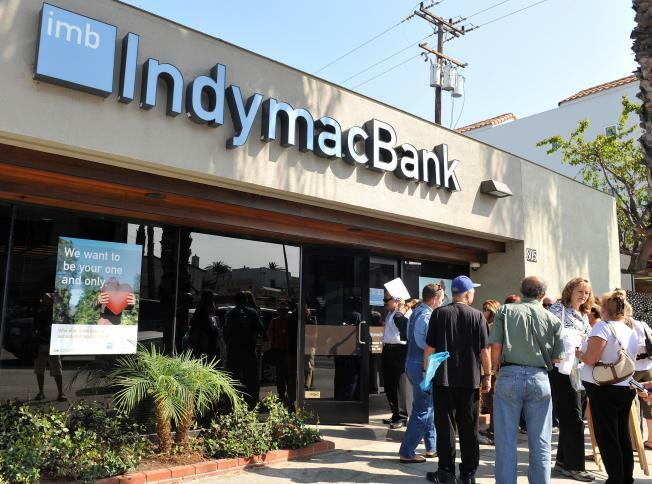 Customers line up in front of an IndyMac Bank branch in Santa Monica, California, on July 14, 2008. Federally-seized IndyMac Bank was due to reopen Monday after suffering one of the biggest bank closures in US history, as the troubled US mortgage industry struggles to stem further meltdown.The regulatory Office of Thrift Supervision (OTS) announced Friday it had placed the California-based bank, worth an estimated 32 billion dollars, under the control of the Federal Deposit Insurance Corporation (FDIC). The mortgage lender, which will reopen as IndyMac Federal Bank, marked the largest bank failure in a year of mortgage and foreclosure crisis highlighted by a surge in defaults and a plunge in housing prices which are rippling through the US economy. AFP PHOTO GABRIEL BOUYS. Employees of the now-defunct IndyMac Bancorp. are charging that Sen. Charles Schumer triggered the third largest bank failure in U.S. history. Schumer questioned IndyMac's viability in a June letter to the Federal Deposit Insurance Corp. and the Office of Thrift Supervision, which employees claim divulged confidential information. The bank was taken over by the government in July. The California attorney general is now reviewing a request made by 51 former bank workers to probe the senator from New York for his involvement in the crash. "From the day (Schumer's) letter was made public on June 26 until the closure of the bank, a run on the bank took place and the failure because inevitable, " the employees wrote to the California AG.